A wholesome gift for a speedy recovery. Nature’s best healing goodies in this delicious hamper to show your caring thoughts. 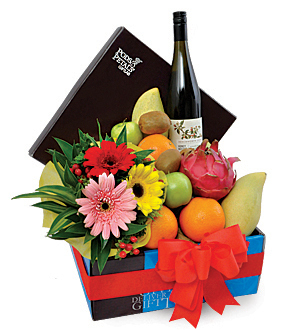 A bottle of well appreciated Beechworth Sparkling Honey Nectar 750ml and an orchard-fresh pack of freshly picked fruits presented with cheery Gerberas flowers. At least 5 types of hand-picked varieties of juicy fruits to be savoured.